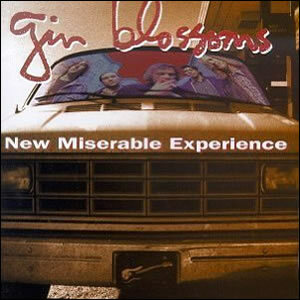 Released during the heyday of the grunge music movement, New Miserable Experience was the peak of Gin Blossoms‘s short-lived fame in the early 1990s. It consists of lean and jangly pop music that hearkened back to some of the college radio alternative pop of the 1980s such as The Replacements or R.E.M. The album was the band’s major-label debut after they had spent years building their popularity at the local level around Phoenix. However, the making of this album came with inner turmoil as chief songwriter and lead guitarist Doug Hopkins became an impediment by drinking heavily and growing stubborn and disillusioned with the recording process, which ultimately led to his termination from the band at the label’s insistence. Hopkins’ writing credits included all four of the popular “hits” from the album, with his penchant for somber lyrics and notable melodies. He founded the Gin Blossoms in the mid 1980s and helped them develop into one of the most popular local bands in Tempe, AZ and facilitated independent record releases. Hopkins, who suffered from mental illness and alcoholism, was staunchly against the band signing with a major label, and this led to his downward spiral in the studio and eventual firing. Hopkins became increasingly despondent as the band rose to fame performing the songs he had written. Shortly after receiving a gold record for the song “Hey Jealousy”, he tore it off the wall and destroyed it. Ten days later, Hopkins committed suicide. As lead singer Robin Wilson later acknowledged; “Without Doug and his songwriting, we never could have signed a record deal.” Quite ironic. “Hey Jealousy” has a jangly power pop motif with more darkly confessional lyrics by Hopkins with a bit of emotional complexity. On Jesse Valenzuela‘s “Cajun Song”, the band displays more versatility with strong harmonies and country elements, something that is more fully explored later on the album’s closer “Cheatin'”. “Found Out About You” became the band’s only #1 hit, topping the Modern Rock Tracks, and the best pure pop song on the album, with a catchy hook and a melodic mix of guitar parts. A few more of the more popular radio tracks include the melodic and restrained “Until I Fall Away” and “Allison Road”, which Has a Buddy Holly influenced beginning, and more pleasant and melodies and harmonies. Throughout the album, the rhythm section of bassist Bill Leen and drummer Phillip Rhodes, provide the steady and driving tempo which allows for movement on top end. This especially true on the album’s heavier tracks, “Mrs. Rita”, “Hold Me Down” and “Hands Are Tied”. Many wondered if Gin Blossoms could replicate the success of New Miserable Experience without Hopkins songwriting. They did reach a level of success with their 1996 follow-up album and a few more hit singles, but by 1997 the band was finished and this album proved to be their apex.